TNS and ESPN have created a new European version of the popular ESPN Sports Poll, which will be intended to provide sponsors, leagues, and the media with insights about the impact that sports has on European consumers and the role it plays in their lives. Initial results were today revealed based on 500 online interviews conducted in January in each of the following countries: France, Germany, Italy, Spain and the UK. "Companies have tools to measure specific aspects of their sports business, like television ratings and media exposure programs. These are important, but they do not tell the whole story. By tracking more than two dozen sports, this study offers brands a 10,000-meter vantage point to assess their target markets across the entire sports landscape. Continuous tracking makes this particularly unique because it negates the seasonal bias associated with comparing sports at a given point in time." Which sports offer the best opportunities to reach a specific target market? What is the true consumer profile of a sports fan? How intense is their fandom? To what extent does an emerging sport have potential to grow? Should my company be an early adopter? How does our property stack up against other sports? Who is paying most attention? Is my company in the right countries? What opportunities are we missing? TNS' baseline study reported a higher general interest in sports within Spain and Italy as compared to France, Germany, and the UK. "While cultural differences can account for how people respond to scaled questions in surveys, both behavioral and attitudinal questions showed greater avidity and activity in Spain and Italy," researchers said of their findings. Football (soccer) and Formula One were the top two mentions as favorite spectator sport, followed by the Olympics and Men's Tennis coming fourth. 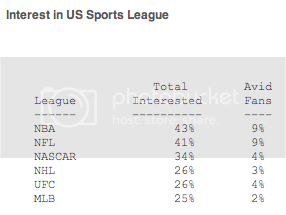 Of American sports leagues, NBA showed the highest level of total interest. "The Sports Poll is unique in that it provides in-depth intelligence about the impact that sports has on the population with respect to involvement, media usage, and consumer behavior," said Artie Bulgrin, Senior Vice President at ESPN. "The monthly Sports Poll tracking in the US helps us identify trends that ultimately affect media and advertising performance. We are enthusiastic about what we can all learn in Europe now." Monthly surveys will continue throughout the year, with detailed findings and trends reported on a quarterly basis. This is only for well-armed expense accounts. How much will a 12-month membership set your company back? $45,000.